The AIRG Speedfire DLX is made to ride; a good balance between stability and speed – available in four sizes: 8, 10, 12 and 14. AirG's Speedfire 2013 DLX series gives you the possibility to ride steep slopes due to low glide ratios but especially the bigger sizes are also made to fly and even to foot launch. With its super tiny packing size it is the perfect wing to hike up the mountains and to enjoy a good run down into the valley. 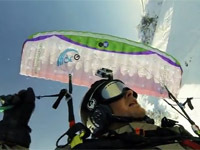 Speedfire DLX 8 – the very little wing for extreme speedriding: highest level of experience and skills in paragliding and skiing required! Speedfire DLX 10 – the bigger brother of the DLX 8 for a better mix between riding and flying. Speedfire DLX 12 – for less advanced riders a good compromise between flying and riding. Speedfire DLX 14 – the biggest of the series, easy to do first steps in speedflying and riding. 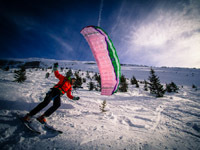 Attention – all speedriding wings require an advanced skills in flying and skiing to get a safe and joyful ride! Weight (kg) ? ? ? ?